Sally Morgan, senior environmental planner and archaeologist, holds a few of the artifacts found recently beneath one of the workers' cabins. The hairpin may have held a woman's hair back long ago, but now it holds a wealth of information. 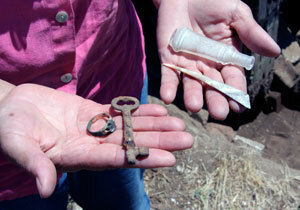 UCSC archaeologists and volunteers found the mother-of-pearl hair ornament and other artifacts recently in the process of excavating beneath and renovating one of the historic workers' cabins in the Cowell Lime Works Historic District at the base of campus. "Finding artifacts that look like they belong to women is really interesting because it suggests women lived here, or the men who lived here had associations with women," said Sally Morgan, UCSC senior environmental planner and archaeologist. 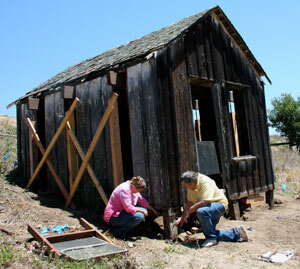 UCSC staff and volunteers with the Friends of the Cowell Lime Works Historic District are working on restoring the structures in the 30-acre district to preserve the campus's history as the largest lime-producing operation in the state. The going is slow since the effort is all volunteer and money for the restoration comes from donations and grants, but new discoveries sprout up as work progresses. With the help of local restoration expert Jan Dekema, staff and volunteers have begun working on one of the remaining workers' cabins. In the 1880s, when the lime works was at its peak, at least a dozen workers' cabins flanked the road past the main entrance; now, only two are still standing. The lime works was established at the campus site in the early 1850s. Lime was a key component of mortar, plaster, and whitewash, and it was used extensively in the building industries of the time. Later, Henry Cowell acquired the lime works and established more support facilities, including a self-sustaining ranch operation, at the site. The Cowell Ranch operations continued until the University of California acquired the property around 1960. The former lime operations area, which is on the National Register of Historic Places, includes the Granary, now a childcare center; the Cookhouse, now the Admissions office; several barns; the Cooperage, where barrels for lime shipping were made; the ruins of former workers' cabins; the Blacksmith Shop; the Carriage House, which now houses staff offices; Cardiff House, now the Women's Center but formerly the residence of lime works owner Henry Cowell; and the lime kilns themselves. While Dekema painstakingly assesses and restores the cabin, aiming for a historically accurate replication of it as it stood in 1910 -- the earliest year the Friends have a photo of the structure -- Morgan and others are performing archaeological digs beneath and around it. "The reason we're doing the archaeology is to try to understand what the everyday life of the workers was like," said Morgan. "There's not much record of that. So we're looking for clues to questions such as, 'Did they eat in their cabins? Did women and children live there, or just men?'" The find of the hairpin suggests an answer to one of those questions. Volunteers also found the shells of clams and mussels, which could mean workers ate in their cabins. "We'd thought they all ate at the Cookhouse," said Morgan. Other items researchers have found beneath the cabin include buttons, overall and denim rivets, a ring, tobacco cans, embossed bottle fragments, and an 1882 nickel. Morgan emphasized that people should be around the cabins only if accompanied by the archaeology and restoration crews. The restoration work includes meticulous attention to every tiny detail, such as measuring and assessing each board in the cabin to determine acceptable repair techniques, making detailed drawings before dismantling, replacing materials such as old-growth redwood in kind (using salvaged wood), and seeking a chemist on campus who can analyze a chip of whitewash from the wall of the cabin and replicate its formula. One interesting detail about the cabins is there's no frame to them, only solid redwood planks, said Dekema. "It's called plank and beam," he said, gesturing to the wide boards that make up the walls of the cabin. "It makes it interesting to us -- it's a very old type of construction. If this was made of modern materials, it would have disintegrated decades ago. It's a testament to the skill of the builders and the quality of the materials that it's lasted this long." Dekema, Friends group president Frank Perry, and other volunteers have been working on the cabin almost every weekend, and they hope to have it ready for interpretive display by the end of the year. "I really thoroughly enjoy this," Dekema said. "I never cease to be amazed by our discoveries showing how they put this together." "It's fascinating because it represents evolving history," she said. "Over time, the building was altered, altered, altered. You see this long historic process." The same goes for the artifacts under the cabin's floor, Morgan said. "You think, if that artifact could talk ..." she said, with a smile. Friends of the Cowell Lime Works is still looking for volunteers. Visit the web site for information or contact the Friends at limeworks@ucsc.edu.